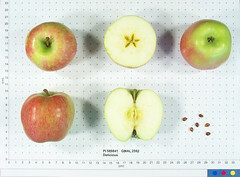 Fruit shape is one of several characteristics used to identify apple cultivars. 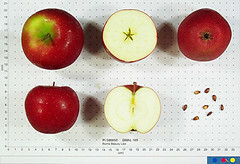 When apples are mature, the fruit is cut longitudinally in half through the core to categorize the shape. Common fruit shapes include round, conic, oblate, oblique, oblong, and ovate as shown below (Figure 1). Fruit shape may differ by growing location depending on environmental conditions. For example, 'Red Delicious' ripened in locations with cool evening temperatures are more elongated than those ripened in climatic zones with evening temperatures remain above 80°F. 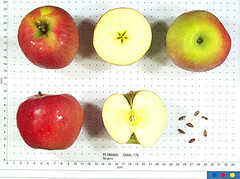 Spring frosts and pests may also alter fruit shape. 'Rome Beauty' round (photo: USDA-ARS-GRIN). Visit ARS-GRIN for more information. 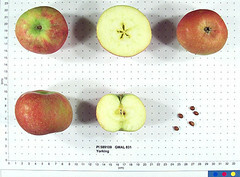 'Braeburn' conic (photo: USDA-ARS-GRIN). Visit ARS-GRIN for more information. 'Redfree' oblate (photo: USDA-ARS-GRIN). Visit ARS-GRIN for more information. 'York Imperial' oblique (photo: USDA-ARS-GRIN). Visit ARS-GRIN for more information. 'Red Delicious' oblong (photo: USDA-ARS-GRIN). Visit ARS-GRIN for more information. 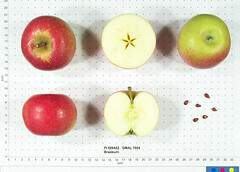 'Spigold' (photo: USDA-ARS-GRIN). Visit ARS-GRIN for more information. 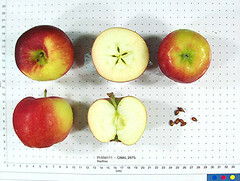 Figure 1: Apple fruit shape as defined by Hedrick in 1924. In the legend, a cultivar is listed first, then the shape. From Hedrick’s “Systematic Pomology” 1924.